One of the most well used capabilities to improve productivity is drag and drop for activities. This is great as users can simply drag and drop an activity to reschedule – either at another time, date or combination of both day and time slot. Once dragged from the existing time/date into the alternative, the corresponding Dynamics 365 activity will be automatically re-scheduled and any tracked activity in Outlook will be updated accordingly. For all users of Dynamics 365 who make use of MyACTIVITYCalendar, this ability can save a great deal of time when faced with dealing with customer and prospect contacts who request changes be made to appointments or call backs. If dealing with real-time demands (phone calls), Dynamics 365 users can easily see on the calendar what alternative dates/times are available and can quickly re-schedule by dropping the original activity into the most convenient new time/date slot. As shown below, having dragged the appointment from the 23rd August across to the 18th September, the Dynamics 365 appointment will automatically be updated, without any need to open the activity record at all. If users wish to be specific in respect of the appointment timing, all that is required is to switch the view to either a weekly or daily view (shown below), whereupon the timeslots are evident on the calendar itself. You simply drag and drop in the same way as when using the monthly or quarterly calendar views. 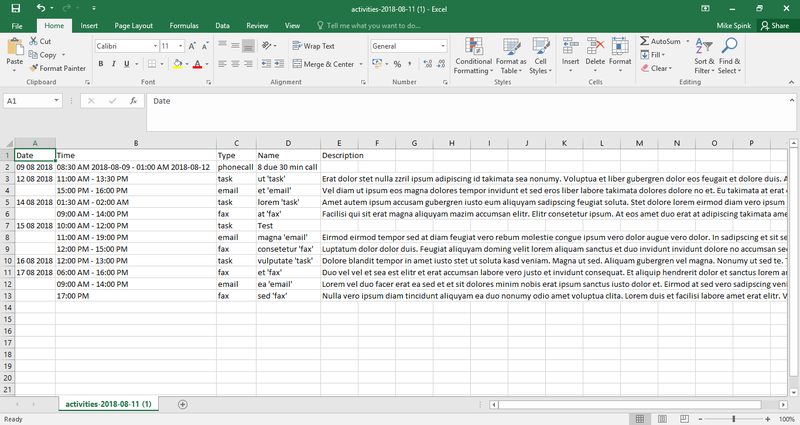 The very latest version of MyACTIVITYCalendar now features two new function buttons that allow users to export activities into Excel as well as providing printing capability. 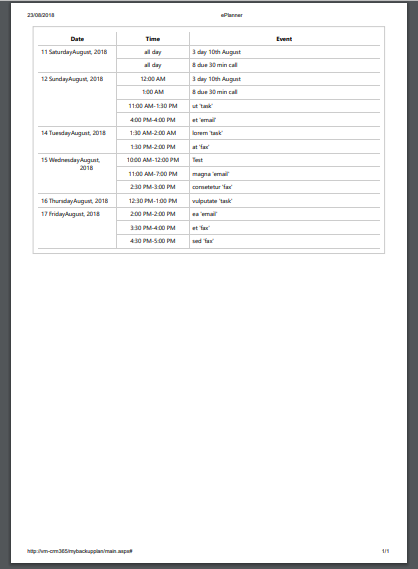 The exports and print out provide copies of agenda schedules, which is pleasing for those of us who still like paper copies (a simple backup) and also like to play around with spreadsheets.